Please note: To access all functions and plugins of Max2Play and constantly get new features, you require a valid Max2Play premium license first. It is activated either by your email address or an activation code. If you don’t have a valid license yet, you may order the Max2Play-Full-Package in our shop. If you have a license key from a reseller and you want to connect your license code to your email address, please click here and follow those instructions. Make sure your Max2Play device is connected to the internet. Navigate to the „Settings / Reboot“ page. Find the textbox „Your eMail-Address / activation code“ within the section „Basic settings for Max2Play“ and enter your license code there. Please note: Your license code is either the eMail-address you have used for your purchase in our webshop (http://shop.max2play.com/) OR the activation code that is provided on the license certificate (promotion or reseller packages). Click on „Save Settings“ and check if the green „Activated“ field appears. Attention: Please read the following notes carefully before you contact our support team. Thank you! We mention this just for the sake of completeness: The most obvious reason would be a typo of course. Please make sure you have entered the license code correctly. You have not entered a valid license code yet or your license has expired. If you don’t have a valid license, you may always order one in our shop. Your Max2Play device has no connection to the internet and thus cannot connect to the activation server in order to validate your license. Occasionally we perform some maintenance work on our servers which could potentially lead to a license validation failure for a short period of time. In this case, please make sure to check our forums, because you will probably find many complaints from other users, as well. We will inform you when the server is back online and validation is working again. 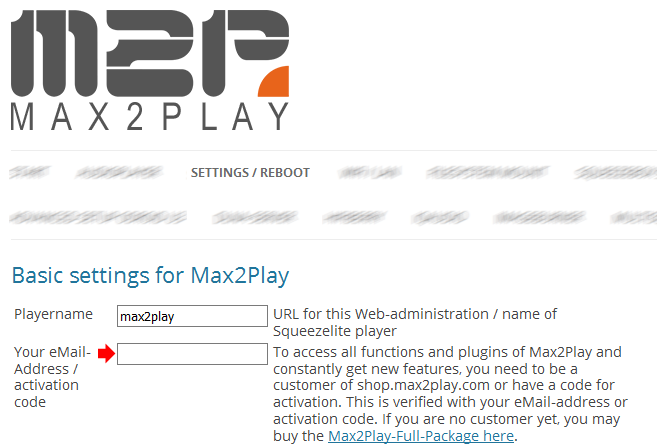 Open your web browser, enter http://max2play/ and navigate to „Settings / Reboot“. Delete the license in the Max2Play interface and click „Save Settings“ with a blank field. Click on „Settings / Reboot“ again, reenter your license and click „Save Settings“. Check if the green „Activated“ field appears.